I had no idea that this project was going to take this long. It seems that this particular project has just had the wrong timing, what with two new jobs and everything else that has been going on. 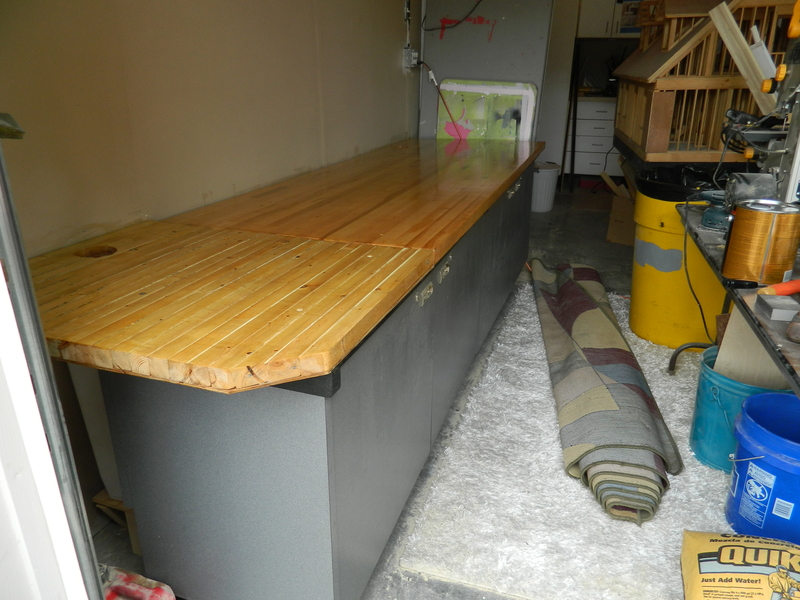 I’ve had The Kid doing the coats of polyurethane on the work surface and the very last coat went on last night. Okay, so I know that the extension doesn’t exactly match, but it is close enough considering that it will be getting dinged, dirty and resides in the garage! I am more happy that it is done. 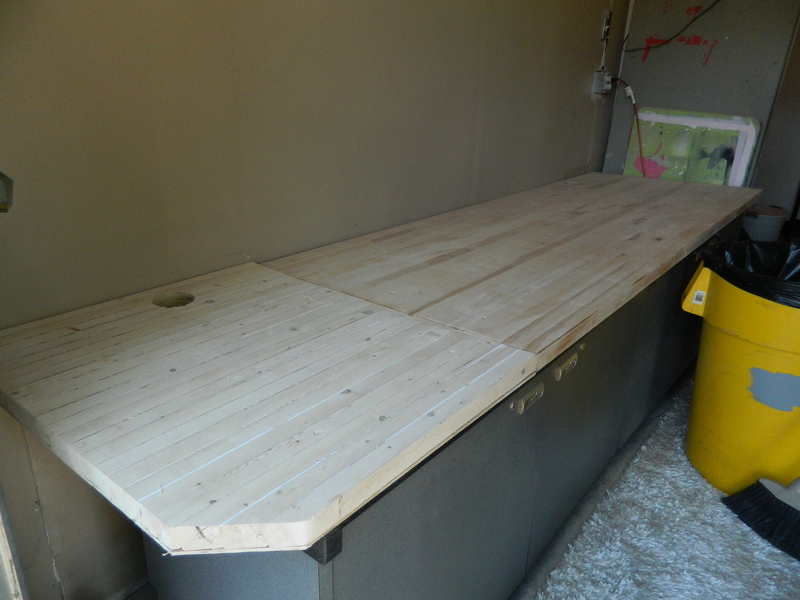 So, the butcher block top that was given to us is on the right and my 30″ extension on the left. This photo was taken when both had been sanded down to raw wood. A closer look and you can see that the raw wood doesn’t even match. Again, I am okay with it even though it would have been much cooler if I had actually gotten closer to matching, but what are you gonna do? You may have noticed the two holes drilled on either end towards the wall. Well, this is my system of getting rid of saw dust. 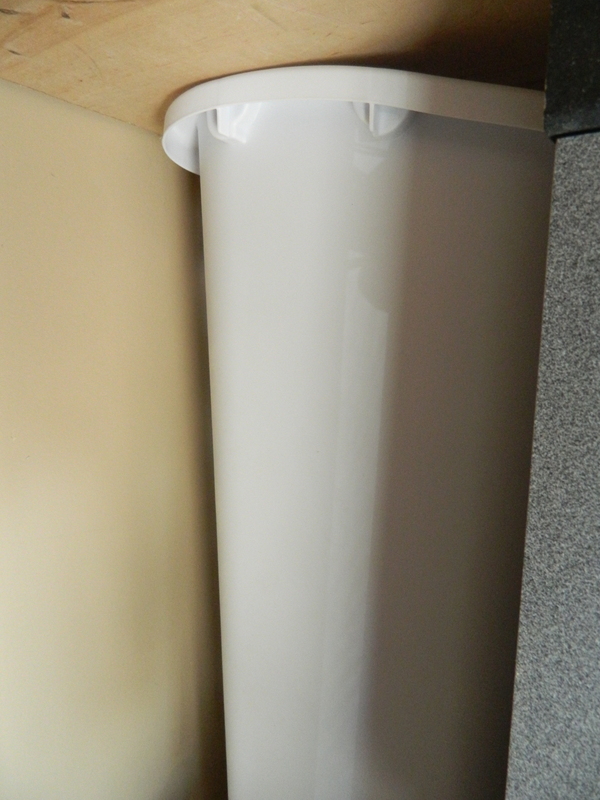 Under the holes and behind the cabinets, I have tall plastic trash cans that will catch the saw dust. Once done working, simply sweep everything towards the holes. The trash cans can be reached on either end for dumping or what we’re likely to do is when the cans are getting full, we’ll just stick the end of the shop-vac into the holes and viola! 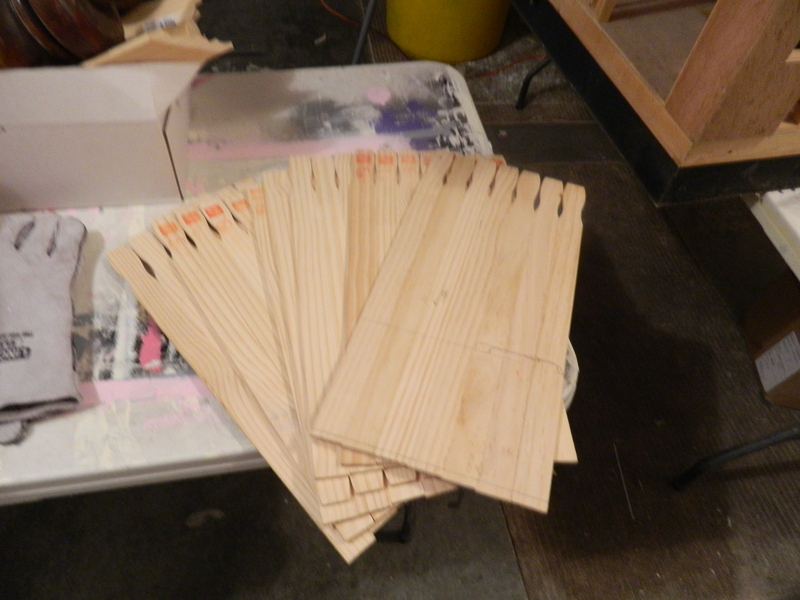 So, four coats of polyurethane and the pieces are becoming quite beautiful. But most importantly, the surfaces will be hard for all future work. 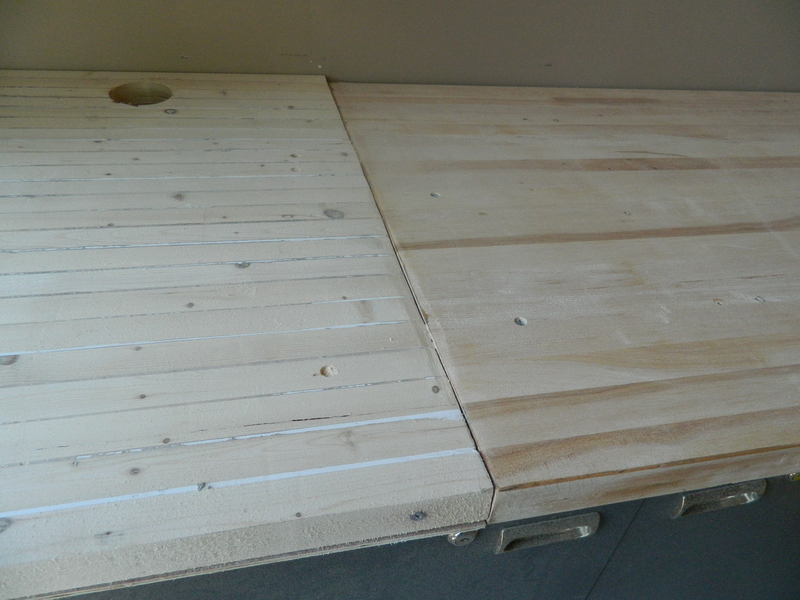 The picture above shows two coats, the one below is with the fourth and final coat. Once we get the tools spread out over it, you’ll hardly notice the difference in woods. 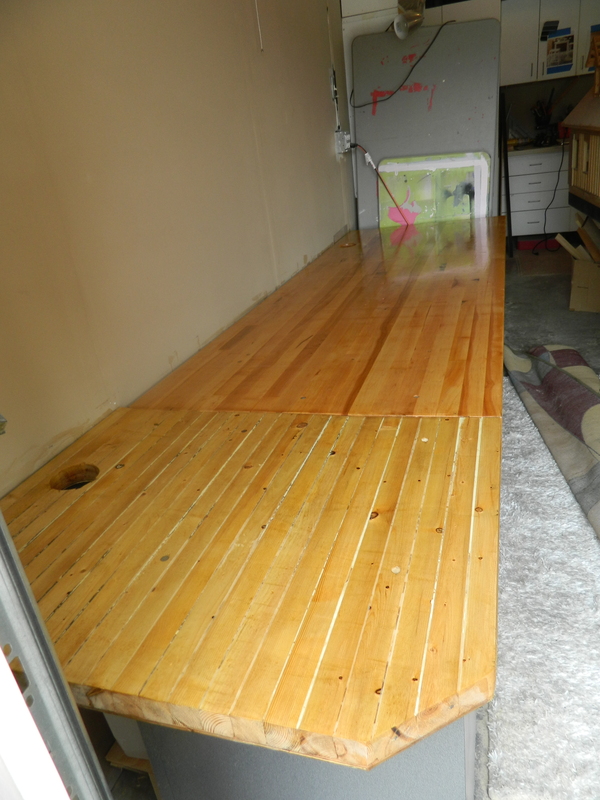 As you can see, I have kept collecting carpets (yes, free from CraigsList) for the garage floors. I occasionally will run out to the garage for something and I really hate having to stop and put on shoes. And it is easier to convince the kid to vacuum rather than sweep. Like rugs of the past, when I drop paint or stain on them, I simply roll them up and throw them away. I am still working on a project that will house my extremely large collection of embroidery thread. I am also working on a thread that celebrates paint stir sticks and all the wonderful things that can be made from them. 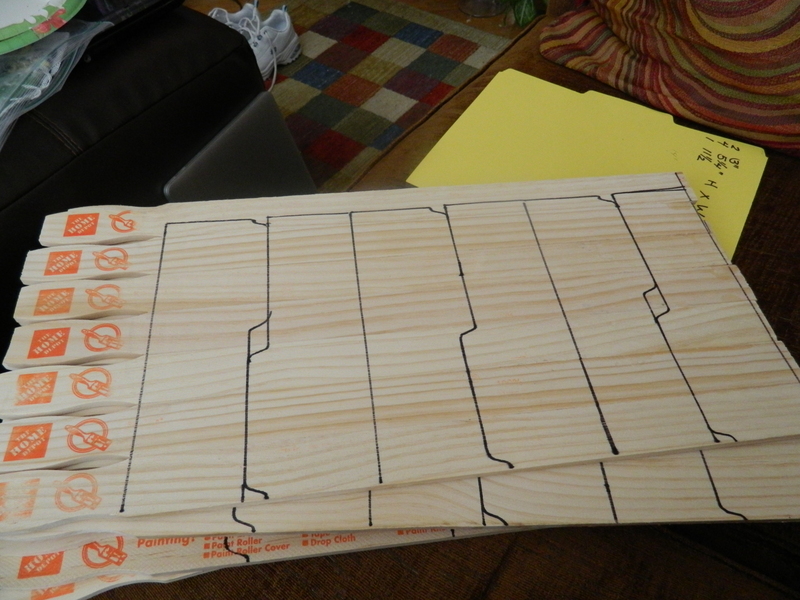 I created a template and then used to it draw the cutting lines for the drawer dividers. Luckily for me, it was The Kid’s job to make all those cuts! 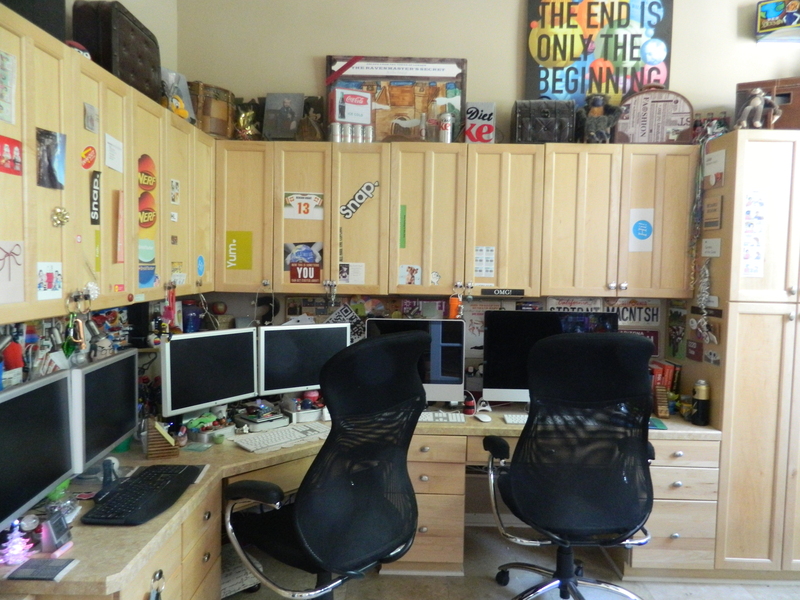 I will write a post from beginning to end on this storage cabinet that started life as a small desk. I love looking at something and seeing something different. 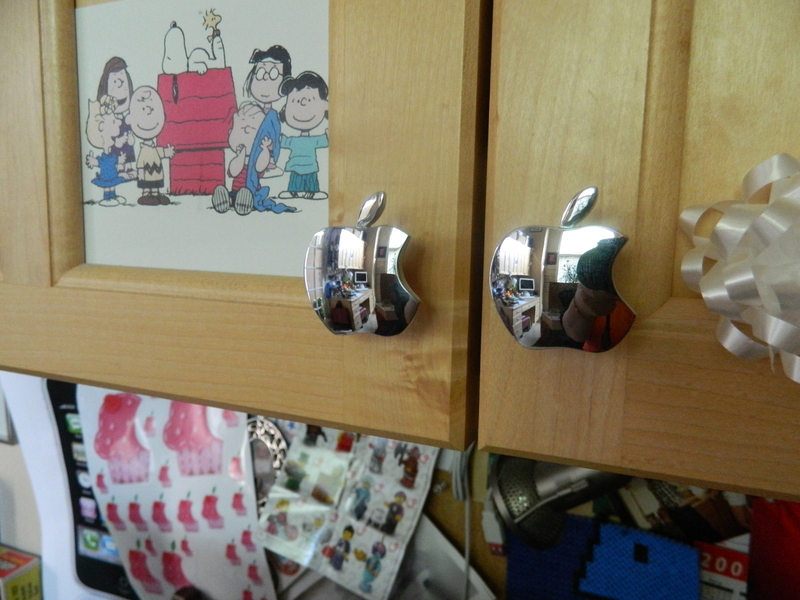 Last quick update… Some time ago, I had purchased these wonderful cabinet knobs. I almost forgot about them as they did travel all the way from China. They arrived last night and so I had The Kid replace the knobs on the upper cabinets of my computer work office… and if you didn’t know it before, you will now: I am a huge Mac fanatic. This is just the icing on that revalation! Okay, so that’s it for today. This weekend will be spent completing the garage project and getting it all in a post before I head back to work on Monday. I hope you’ll come back and see the grand unveiling!